I’m always looking for new ways to encourage my students to read. If you’re a primary teacher, I know you do, too. I encourage students to read alone. To read with their teacher. To read to a classmate. To read to a big buddy. To read to their parents or siblings. The more you read, the better reader you will be, so it just makes sense. Because our classroom is connected with so many people OUTSDE the four walls of our physical space, I have sometimes been able to find a pre-service teacher or someone else who is willing to listen to my students read via Skype. When this happens, I have the students choose a book ahead of time. Then, I just make a list of the students who will be reading, post it near the computer and make sure the first student is connected and ready to go. As each student finishes reading, she tells the next student on the list that it is her turn to read. I am free to work with other students while this “reading center” runs itself. 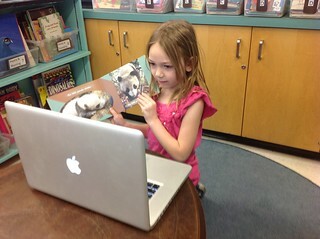 For a few years, I had wondered about the possibility of buddy reading via Skype with a peer rather than an adult. How could we make that work? Fortunately, Karen Lirenman in Surrey is as keen as I am to push the boundaries of what is possible in the classroom. For most of the last school year, we attempted to connect our classes around curriculum content four times every week. Every Monday, Tuesday and Wednesday, we did buddy reading. Every Thursday, we played a game of “Guess my Number”. First, Karen and I both made a list with our class of books that they especially liked and would like to be able to read with someone in another class. These lists were fairly long so that we had lots of chances to have books in common. The students chose a wide variety of books, including both fiction and nonfiction, both at their reading level and above it. Karen and I shared those list with each other and then, we had a Skype call to confirm which books we both had from the list. We chose a few popular books that the students had not mentioned as well to make up for the ones that one of us had but the other did not. Then we put the books in a special bucket so that they would be easily available when someone was going to read soon. Next, we set up a Google document with a table. My students chose books the first time and Karen’s students chose someone to read with. When we’d been through all of the names, her class chose books and we fit our names in. You’ll see from the image that at first we thought it was important to put the grades of the students since we both had a grade one/two split grade classroom. We later stopped this, as it didn’t seem to matter and was not necessarily an indicator of reading proficiency. We did buddy reading for about 15 minutes each time. Sometimes we would get through as many as three pairs of readers, and occasionally only one pair would finish their book, but generally a couple of pairs would have time to read. I tried to give my students a heads up two or three days ahead of their chance to buddy read via Skype so that they could “practice” their book ahead of time. Because the books were in the special bucket, they were easily found. It’s important to be flexible Since Karen’s classrooms is a thousand miles almost straight east of mine, we are in different time zones. We could not both do reading buddies during the first period of the day. This was further complicated by the fact that my province does not change time, so when her class sprang ahead (and we were still in different time zones), we had to re-jig things. Karen and I also sometimes do things outside of our classroom, and when you add in special assemblies, field trips and the multitude of other things that frequently interrupt the school day you can see that we had to be willing to adapt when plans in one school changed. The hallway really works best. Karen figured this out right away. In my classroom, I tried doing it without headphones and then with them, but ended up with the reading going on in the hallway. No headphones were needed and it was much quieter! All of the students were eager to participate and did so well. We both had students that surprised us. No matter what behavioral or academic difficulties the students had, they all participated eagerly. We sometimes had a support buddy beside one or both students just in case their help was needed for any reason. Everyone stayed on task. Getting distracted did not seem to happen when the other student was on a screen instead of sitting beside them. When students are engaged and reading, we know it leads to better readers. Would I do it with our students again next year? In a heartbeat. I so enjoyed reading this post and am going to share it with the users in our learning center community! We see teachers connecting across districts, states, countries, and the globe every single day – they have great ideas for collaborations with other teachers and classrooms but they also love being inspired by the ideas of other educators. Reading about how you and Karen have worked to set up your partnership and to plan your connections/exchanges will be extremely interesting and helpful to others. I got to know Karen Lirenman first of all through Twitter. I have made many contacts that way. If you are interested in trying this and you are not on Twitter, you might also try Skype in the Classroom https://education.skype.com/. It is free to sign up and you can ask the thousands of teachers who are signed up there if they are interested. I connected with Karen via Twitter as well! Love keeping up with all of the great things she shares and am thrilled to have her as part of my PLN! Thank YOU, Michelle. It is so gratifying to me to see that so many teachers are now collaborating with others. I’m glad if I can encourage them. So amazing to watch all of the connections and collaborations that take place! How did you make contact with the other classroom? Good luck with making classroom connections this year! Last year we did a couple of projects with a class on another town, like a virtual poetry jam, and the other teacher and I are hoping to do some kind of virtual literature circles. This would be a great starting point for that! These all sounds like great ideas, Audra! At my school we had a volunteer who read to my first and second graders once a week. When she got cancer and couldn’t be at the school she read to us by Skype instead. She was about 80 so it was a learning curve for her but our technologist assisted her. It was a magical time and memorable as she passed away the next fall. Thinking about doing it with pen pals. great idea!! What a wonderful experience for your students! Thank you for sharing this use of Skype. This is an amazing story! I love how this volunteer was still able to continue as a reading buddy – I bet it was one of her bright spots as she dealt with her illness. Virtual read alouds are such an easy way to start a classroom connection! 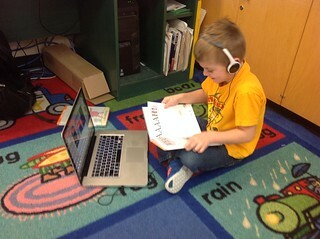 Two of the teachers I work with connected via our learning center and decided to share stories virtually – Nikki (who is from England) read to Natasha’s first grade class one day and Natasha (who is from New Zealand) read to Nikki’s class another day. The students loved it so much…. and from there, the two classes and teachers paired up on other collaborations. I was fortunate enough to share a few of my favourite stories (from one of my favourite Canadian authors) with Nikki’s class this year as well. I am not sure who enjoyed the experience more – me or her students! This is such an awesome idea, I am so excited about it, and promotes so many great qualities! First, I am sure it gets the kids excited to read. This also encourages them to want to practice reading, and building on their skills. 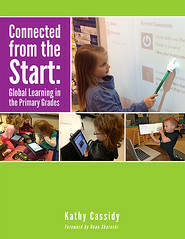 Next, you are building on 21st century learning. This teaches kids to collaborate using technology. They are learning a very important life skill for their future in the work place. They are learning computer edict, and practicing their language and social skills as well as they’re reading. As a teacher this offers many benefits as well. The teacher is able to collaborate with other teachers across the state, or in another school. This also is a great way to utilize a group when their is no assistant for reading. This frees up time for the teacher, and is a great independent task that is very engaging for students. This is such a great idea and has so many benefits. My only question is how to get parents on board. Sometimes just photos posted on line is hard to get permission. I can see explaining the benefits may help the parents be more understanding. I have never had difficulties with parent permission because they have seen that I have firm rules in place. 1. Nothing gets posted unless I see it first. 2. I NEVER match a name with a picture. In my 10+ years of blogging I have had two parents ask for pseudonyms (at my suggestion) and have had two parents request their child not be included in the pictures on my blog. This is an amazing idea! I love how the students are using technology and also engaging with others so many miles away. I think I will try this with my fourth graders reading to Kindergartners. I will probably start at my own school site first and then try to connect with a teacher somewhere else. This also gave me the idea of using pen pals with the Ipads that my students have. They will be able to practice effective communication and typing skills at the same time. Your blog really got my mind going on the possibilities to empower my students to advance in the area of technology. Wow! I am so intrigued by so many of your posts, but this one really stuck out. I am in my third year of teaching first grade and have been looking for new ways to expose my students to technology and other first graders across the state (my original thought was pen pals). This idea took pen pals to a completely different level and I am SO excited to implement it in my classroom. I plan on starting with another teacher at my current school and then take your advice of connecting with other educators via Twitter. I’d love to get the kids talking to other students in different countries as well. First grade is such a huge year for reading development and I am striving to get my students to have intrinsic motivation when it comes to reading. They LOVE reading to their fourth grade buddies so I can only imagine the motivation Skyping will spark in my sweet firsties. Thank you for sharing so many of your wonderful ideas! Such a simple, yet great idea! I am going to share it with our iEngage educators from Moldova. If you plan to continue the initiative and are looking for international ”Reading Buddies”, please let us know (iengagemoldova@gmail.com). We would love to! Unfortunately the time change between us makes it impossible. I hope someone who CAN do it with you will see this and contact you. I think this activity is such a well thought out project. It incorporates both improving a student’s reading skills, as well as brining cultural awareness to a child that they might have otherwise not have been exposed to. I think it was great how you and another teacher 1000 miles away collaborate with each other and are able to be flexible with each other’s schedules. By implementing this activity, children are exposed to other environments instead of just the 4 walls of their classroom. This activity brings together so many components of education that are necessary. I think this is definitely an activity I will use one day in my future classroom. I think your activity is such a thoughtful and planned out lesson. 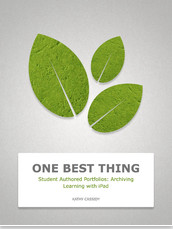 It incorporates several aspects that I believe are important to education. While this activity promotes the increase of a child’s knowledge to for reading, it also allows children to be exposed to other environments and people that they might have otherwise not been exposed to. I think its great how you collaborate with another teacher 1000 miles away. That must take such extensive planning and flexibility. I believe this activity will have such an impact on children’s lives, as it will help them make friends outside of the 4 wall of this classroom. I will definitely use this activity in my future classroom. I love this idea! My class has tried “Guess my Number ” through Skype and “Guess the Animal” but I would have never thought to use reading buddies through Skype. We recently got rid of our accelerated reader program and are trying to figure out a way to bring back the love of reading to our students. I think this will be a great idea to use. My school is fairly new to Skype and I teach second grade so it has been a slow process in trying to introduce all these new technology adventures. My class is very excited about all the technology we have incorporated into the classroom so far,and I can not wait to try this with my second graders. Thanks for sharing!